Hot Tea Maker- What features should I look for? For centuries, tea lovers have been trying to make the perfect cup of tea. Nowadays, there are a number of devices that can help you brew that perfect cup. Just to be clear, the term “hot tea maker” is sometimes used interchangeably with all-in-one electric tea makers and also with devices that need an outside source to heat up water such as tea infuser mugs or pitchers. This article will focus on electric hot tea makers that brew loose leaves and use electricity to heat up the water. You can see my other articles in the Tea Makers category for information on other devices. With these automatic tea makers, you never need to worry again about kettles, teapots, or teas that have been over-steeped. The perfect cup of tea relies primarily on the quality of the loose leaves, the proper temperature, and the brewing/steeping time. There are also other factors like the quality of the water, but only you can control that. In my opinion, one feature that is absolutely necessary is variable temperature and steeping time control. The reason being is that each tea type whether white, green, black, or oolong requires different brewing times and temperatures. There are also other types of loose leaves that aren’t technically teas like herbal tea, but also require their own instructions. Once you become a tea lover, you will realize how important temperature really is to the perfect cup of tea. 1. Pre-set brewing times- some hot tea maker can be programmed to brew your tea automatically such as in the morning, so you have a fresh cup ready to go upon waking. 2. Hot water maker- many of these devices can also warm up hot water for you if you want to use it in soups, hot chocolate, etc. 3. Tea warmer- You also want a device that can keep your brewed tea warm for however long is necessary. If you plan to brew 4-5 cups and drink throughout the day, then you may want a device with a keep warm feature. I have the Breville Tea Maker, which keeps the tea warm for one hour, which is fine just for me (I just re-brew if I want a cup later). Others may want a device that keeps the water warmer for a longer period. 4. Easy cleaning- some devices have parts that are dishwasher safe, while others have parts you have to hand wash.
5. BPA Free- With tea being so beneficial for our health, it is important that our tea makers do not contain any harmful chemicals that could get into the tea itself. This should be a standard feature on most tea makers, but check for this in the description or call the manufacturer. 6. Price- With hot tea makers, you get what you pay for. For example, Adagio Teas triniTea Teamaker is much less expensive than the Breville Tea Maker, but only offers two brewing temperatures, has flimsier materials, and lacks a measurement for how much water you put inside. In my opinion, the best hot tea maker is the Breville Tea Maker. I’ve had it for over a year and use it on a daily basis. 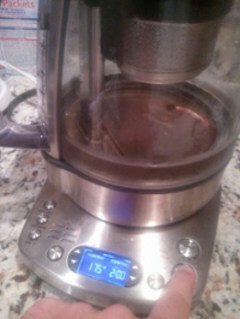 It is the only tea maker I have ever purchased. I would recommend other tea makers, but nothing else comes close. If you have any other recommendations, feel free to leave them below. Thanks. What are the Benefits of a Cast Iron Tea Kettle?